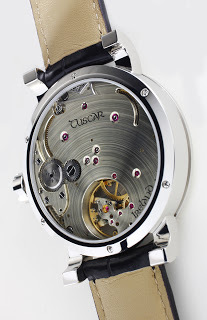 The Irish McGonigle brothers, John and Stephen, have finally unveiled the Tuscar, a time-only watch and their second timepiece after the tourbillon. This watch was a long time coming – the tourbillon was unveiled in 2007 – and has been keenly anticipated by fans of indepedent watchmaking. 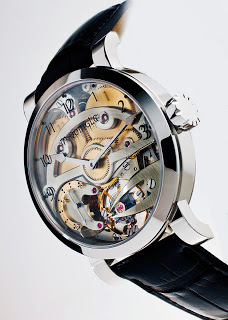 At first glance the watch reminds me of a Greubel Forsey but the details are unique and reminiscent of the Celtic styling of the McGonigle tourbillon. And like the tourbillon, the finishing depicted in the photos also looks superb. This will be available in a limited edition of 20 pieces in rose gold, following the sold-out “One in Ten” launch series. Click here to see a 2007 interview I did with the brothers.